Every Mac comes with a one-year limited warranty and 90 days of technical support.1 AppleCare+ for Mac extends your coverage to three years from your AppleCare+ purchase date and adds up to two incidents of accidental damage coverage, each subject to a service fee of $99 for screen damage or external enclosure damage, or $299 for other damage, plus applicable tax. In addition, you'll get 24/7 priority access to Apple experts by chat or phone. Add your Mac selection to your cart. Then add AppleCare+ from the pop-up window. At checkout, ask your Best Buy Customer Specialist for AppleCare+ when you purchase your Mac. To receive AppleCare+ product support or service, schedule a reservation at a Best Buy store, visit an Apple Store, call Apple at 1-800-275-2273, or visit Apple.com/support. If you have any questions or changes required on your AppleCare+ Monthly Pay Plan for iPhone, please contact 1-800-433-5778. 1. Local telephone fees may apply. Telephone numbers and hours of operation may vary and are subject to change. 2. Global repair coverage may be subject to certain restrictions. See terms above for full details. 3. Availability depends on the country in which service is requested and the location of the Apple Authorized Service Provider. Apple may also request that the customer replace components with readily installable parts. See terms above for full details. 4. Service coverage is available only for Mac and its original included accessories for protection against (i) defects in materials or workmanship, (ii) batteries that retain less than 80 percent of their original capacity, and (iii) up to two incidents of accidental damage from handling of your Mac, each incident being subject to a service fee of $99 for screen damage or external enclosure damage, or $299 for other damage, plus applicable tax. If your Mac has catastrophic damage from an accident or it's inoperable after unauthorized modifications, you will need to buy a replacement. 5. Must be purchased up to two years before your Mac purchase or during the term of your AppleCare+ coverage. 6. For Mac computers running OS X Server, AppleCare+ covers server administration and network management issues using the graphical user interface of masOS Server. 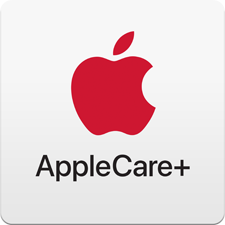 For advanced server operation and integration issues, purchase AppleCare OS Support.